The New Year always brings new opportunities, new inspiration, and a new time for self-reflection. If your goals include delving deeper into classroom management strategies and tools, Class123 (TeachersFirst review) is a site that you won’t want to miss. The Tech Tool of the Month for January offers basic classroom management tools for grades K-6, plus so much more. This tool is device agnostic and available on a web browser or as an app. I chose this tool because of the amazing and useful (yet simple) features that are included to help to manage the classroom. This tool includes basics that any teacher could utilize: a timer, a seating chart, a bell to ring when you need your class’s attention, an attendance tracker, and a random picker (used to choose names or activities). Most of these engaging tools include unique animations, sure to keep elementary students’ attention. Use the timer during centers, quizzes, and other timed events. Rearrange your seating plans each month using the seating chart feature. The random picker could be used to choose groups, call on random students, and more. If your class needs to decide on a class reward, project options, etc. put the choices on the random picker and spin to assign the topics. Class123 offers even more in-depth tools. The chalkboard area allows teachers to create and share lesson plans. You can also use Class123 to offer feedback to students. Set both group and individual goals. Celebrate the accomplishments and provide positive feedback at any time using any device! 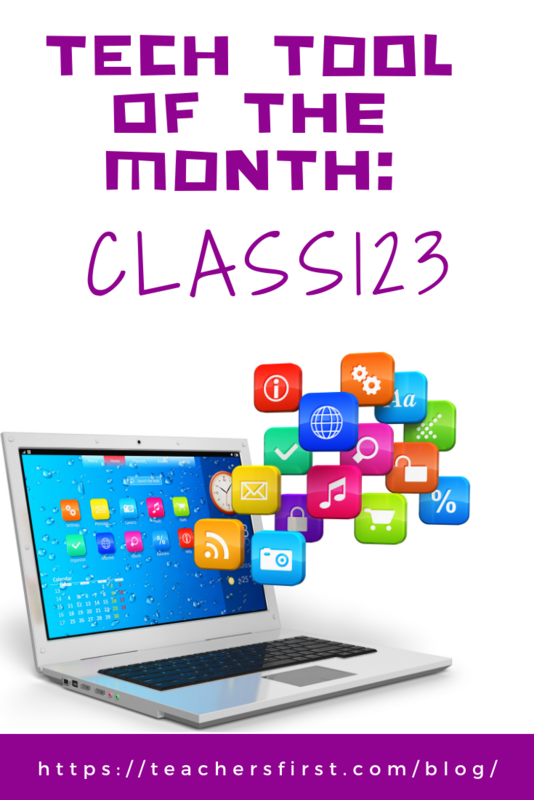 Get families involved in Class123 by inviting parents and students to join your class using a special code provided by you. You can share class stories, upload photos and videos, create and share polls, and send private messages. Share individual reports with families and offer feedback about students. Use Class123 to give your parents a glimpse into their students’ class activities. Please be aware that Class123 falls under the FERPA laws for “directory information” and “educational records.” Any school getting funds from the Department of Education (public schools) is required to disclose to parents and get written consent to use Class123 with their child. Click to view the full TeachersFirst Review. Previous Previous post: Digital Equity – What you need to know.